Since my return from holiday I've been looking after Ben (my grandson aged 8). Ben loves fishing so we had to go once or twice. The weather was nice and warm so the first day I opted for a spot of carping. BIG mistake! After a couple of hours without any sign of surface action even I was bored so when he said "Can we go home grandad?" I was quite relieved. The next time he came I decided it might be best to try for smaller stuff so we went to a local lake that I had not fished for years. It used to be packed with a wide range of fish of all sizes so I thought that there was a good chance of Ben 'bagging up'. 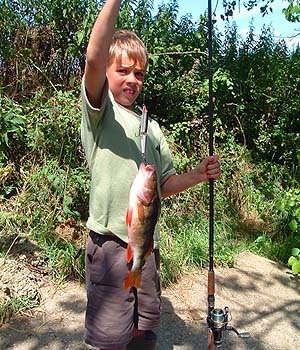 He had his (spinning) rod with a small float and a size twelve hook. The bait was a few white maggots. For the first ten minutes nothing happened. I could see the 'Not another blank!' expression on my associates face. Then he had a bite, struck and landed a nice half-pound roach. Phew!!! As we fed in more maggots the rudd got going and eventually he was landing one about every ten seconds. 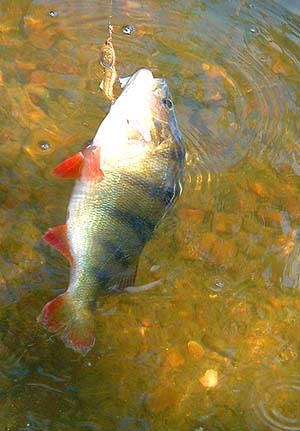 In addition to the rudd (biggest about four ounces) there were a number of tiny perch, and a bream hybrid. Ultimately the score for two hours was 81 fish. The most interesting event was about fifteen minutes before we packed in. Ben was just about to lift another rudd from the water when there was a mighty swirl. Pike! I thought but Ben, who not surprisingly has sharper eyes than me, said it was not a pike but had red fins. We deduced that it must have been a big perch and (foolishly) dropped the rudd back in without tying on a bigger hook. After a couple of minutes the rudd was taken and the fish ran off. Needless to say we failed to connect. Typical! The following day Ben said he wanted to try somewhere different (how about that!). So we went over to a local river for a spot of spinning. I tied on a J11 Rapala and second cast under the lip of a weir, right under the foaming white water Ben caught a nice perch. Five more followed including a good one of almost a-pound-and-a-half taken on a decrepit Mepps Mino. Following the previous day's fiasco Ben was chuffed. His biggest of the session.